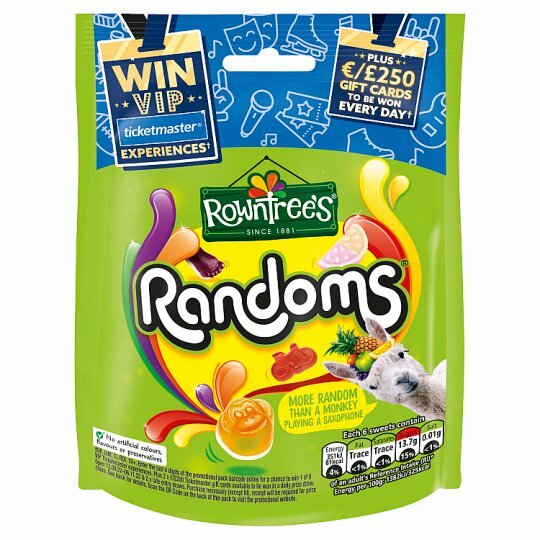 Bring out your random side with every pack of delightfully quirky, completely unpredictable Rowntree's® Randoms®! From ping-pong paddles to paintbrushes, snowflakes to saxophones, every bag contains a random combination of these fruity flavoured, chewy sweets. With so many different shapes and flavours, there are millions of possible combinations - you'll never know quite what you're going to get! Did you know that we don't use artificial colours, flavours or preservatives in Rowntree's® sweets? It's even more reason to enjoy the different flavours, textures, shapes, and colours in every playfully random bag. These brilliantly random sweets are brought to you by Rowntree's®, the makers of the classic Fruit Pastille. The story begins in 1862, when Henry Rowntree bought a cocoa works in York and transformed it into a confectionary company. In 2009 Randoms® were born, bringing fruity randomness to the family. Have you tried ROWNTREE'S 30% Reduced Sugar RANDOMS? Deliciously fruity gummy sweets with hundreds of random combinations!